As an author, having a mentor to help you improve your writing can be invaluable. A mentor can help you to get unstuck or assist you in taking your writing to another level, and usually shares advice direct from his or her experience. K.M. 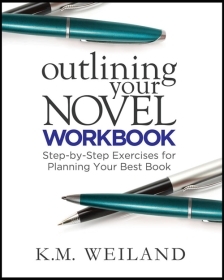 Weiland is such an individual who has been writing herself since she was a little girl, and these days, uses her award-winning blog called Helping Writers Become Authors to support writers make the transition to becoming published authors. Her blog covers all aspects of fiction writing, such as character creation and development, structuring your stories, and editing them. K.M. also shares inspirational advice to help writers be motivated, and tips on how to live life successfully as a writer. We interviewed the lady herself to find out more. Read on to learn what K.M. had to say. Hi K.M.! Welcome to the e-Books India magazine! We’re delighted to have you with us. Can you please tell us a bit about where you’re from, you’re background, and how you got into writing books? I’m a very stereotypical writer chick, hibernating in my make-believe worlds, most of which are either historical or fantasy. I’ve published three novels A Man Called Outlaw (western), Behold the Dawn (historical set during the Third Crusade), Dreamlander (fantasy), and the non-fiction writing how-to books Outlining Your Novel, Structuring Your Novel, Jane Eyre: The Writer’s Digest Annotated Classic, and Conquering Writer’s Block and Summoning Inspiration—as well as the Outlining Your Novel and Structuring Your Novel Workbooks. You’re the founder of the Helping Writers Become Authors blog. When did you start this blog and why did you start it? It was all an accident, believe me! I stumbled into blogging about writing because, hey, every writer needs a blog, right? And you’re supposed to blog about what you’re interested in, and that would be…writing. Then one day I woke up, and the blog had just sort of taken off! I’ve been writing fiction since I was twelve, so I was an author long before I was a teacher of writing. I’d published one book and was close to publishing another before I started the blog. Really, I think the site has been as much of a blessing to me as it has been to anyone. Other than the marvellous writer folk I’ve gotten to meet, I’ve also learned so much by writing about writing. Blogging about writing has been an extremely rewarding experience for me. I’ve no doubt whatsoever that I’ve learned as much, if not more, from it than have any of my readers. They say, “Those who cannot do, teach,” but I don’t think that’s true at all. When you’re forced to distill thoughts into a teachable form, you learn so much more from it yourself. I keep a running list of blog article ideas, and in over six years, I’ve never run out. Many of my ideas are based on the lessons I’m learning in writing my own novels; other posts are subjects requested by readers. A large part of your work involves mentoring authors. What are some of the common questions you get asked by authors who want to work on their fiction writing? A question I get asked a lot is, “How can I make sure my book is unique?” I always tell authors there’s nothing new under the sun. Every idea is bound to have something in common with an already existing story. In all honesty, I wouldn’t worry about it too much. If you love your story, write it the way you love it. My portal fantasy Dreamlander is based on the idea of a parallel dream world—not a new idea at all. But it’s my version of the idea that makes it unique. Right now, I’m working on a superhero story. Hardly anything hasn’t been done in that genre, but there’s always room for an author’s personal (and therefore unique) spin. If you’re passionate about your idea, that’s the first and most important ingredient. For a budding author who is new to your blog, how do they get the most out of it? Readers can subscribe to catch the weekly posts on Sundays, Wednesdays, and Fridays or browse through the archives. There’s also a great search feature at the top of the right column. In my posts, I talk about everything from plot and structure to narrative tone to POV choices to dialogue and description. You’ve also published numerous books including some nonfiction ones that help authors. Can you please tell us about one of these nonfiction books that has particularly helped authors and, based upon feedback from readers, tell us what people found useful about it? The concept of story structure revolutionized my own writing process. It excited me too much not to write about it. That was the beginning of my book Structuring Your Novel. That being so, we have to ask ourselves, “Why?” The answer, of course, is that structure creates stories that not only balance the rise and fall of action, but also time the important turning points, so that they have the best chance of impacting and resonating with readers. What writer doesn’t want to do that? A conscious understanding of structure allows us to understand the theory behind story, which then allows us to discover why certain stories work and others don’t—and how to make sure our stories land in the former group. We would like to say a big thank you to K.M. for joining us at e-Books India! Be sure to check out her blog Helping Writers Become Authors for wonderful advice and support for writers.